If Florida Sen. Marco Rubio needed a hug after the devastating loss in his home state that ended his bid for the Republican nomination, his colleagues were there for him, greeting him warmly as he returned to vote Thursday. Then he turned his attention to questions about his political future. Rubio came back to the Capitol in the afternoon and after taking his first vote this month, declared to a small group of reporters that he would finish out his term and would not seek electoral office any time soon. "I&apos;m not going to be vice president. I&apos;m not running for governor of Florida. I&apos;m going to finish out my term in the Senate over the next 10 months. 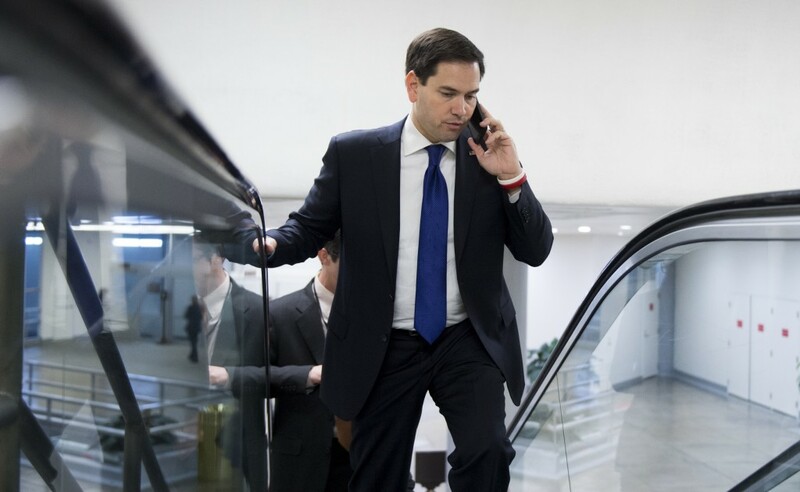 We&apos;re going to work really hard here, and we have some things we want to achieve," Rubio said. "And then I&apos;ll be a private citizen in January." Asked if he was going to endorse Sen. Ted Cruz of Texas for the GOP nomination after having told Minnesota supporters that Cruz was the remaining conservative in the race, Rubio said that he had nothing to announce at this point. When he returned to the Capitol, he walked briskly through the Senate Subway tunnels to lunch in the Mansfield Room before heading to vote on the floor. Talking into his phone, avoiding eye contact with nearby press and trailed by a lone aide, Rubio was greeted warmly by his fellow Republicans, who applauded him behind closed doors. The clerk started calling the roll for the vote on whether to direct the Senate legal counsel to bring a rare civil contempt action and senators began voting on the the last order of business before their upcoming Easter recess, which lasts until April 4. Rubio came down the center aisle with Senate Majority Leader Mitch McConnell, R-Ky., and was surrounded by well-wishers, who patted him on the back, shook his hand and hugged him. Then he went to the clerk, flashed a broad smile and voted thumbs up on the measure. After that, he ducked out of the chamber to a pre-arranged gaggle with members of the press, then returned to another of his senatorial duties, a routine meeting of the Intelligence Committee in a secure room in the Hart office building. When Rubio announced he was running for president, he decided to forgo a re-election bid in 2016, setting off an open-seat scramble in Florida that could determine the majority in the Senate next year. Asked if he would endorse in the GOP primary in his home state&apos;s Senate race, Rubio told reporters simply that, "The lieutenant governor is a good friend of mine." Lt. Gov Carlos Lopez-Cantera is among the Republicans vying for the nomination. Earlier in the day, when Rubio returned to greet staff in his office in the Russell Building, his staff captured the moment on video and tweeted it.